If you own a dog or cat, you know how important food and exercise are for their health. But pet dental services may be lower on your list. After all, wild animals don’t get their teeth brushed, so why should your dog? But, in reality, regular pet grooming and dental treatment are vital for your furry friend’s health. Just like humans, pets experience dental decay. They also find this condition painful, especially when biting or chewing. Poor dental hygiene can affect your dog or cat’s eating habits, leading to malnutrition. When your pet is uncomfortable or in pain, they’re more likely to be moody and even aggressive. 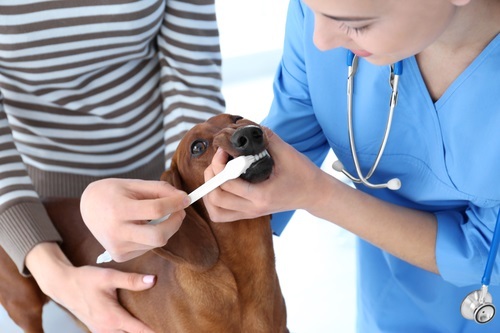 A healthy pet is a happy pet, so basic dental care is a great way to prevent behavioral problems. One of the least pleasant aspects of pet ownership is bad breath. Thankfully, if you’re diligent about pet dental care, you can improve their breath significantly. This cuts down on unpleasant odors and makes your dog or cat more fun to snuggle with. If your furry friend suffers from tooth decay or gum infections, the problem doesn’t end with their mouth. Bacteria from infected teeth will travel through their entire body, damaging their heart, lungs, and digestive system. By preventing decay, you help protect their overall wellness. Good tooth care is essential to keeping your pet happy, healthy, and clean. If your puppy or kitten is overdue for their teeth cleaning, schedule an appointment with a local vet or groomer today. PetPlex Animal Hospital in Buckeye Lake, OH, provides skilled veterinary service to your furry friends throughout the surrounding area. From emergency treatment to grooming, training, and pet dental services, this facility provides a full range of care for your animals. To make an appointment, call them today at (740) 929-3300 or send a request online.